Description: 3-Inch Ordnance Rifle is mounted on a large red granite base. 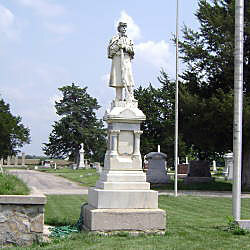 The base is inscribed: "In Memory Of ~ The Soldiers Of ~ The Civil War". Large delegations from the G. A. R., Woman's Relief Corps from Marysville, Seneca and Beattie, and the Marysville drum corps assisted in the dedication. 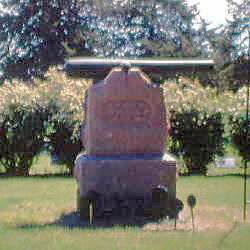 The rear is inscribed: Erected By ~ Waterville Post ~ No. 280 G.A.R. 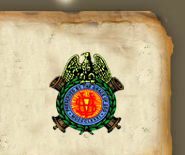 ~ 1885". 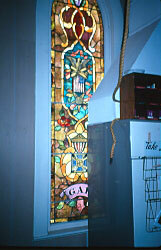 Description: This stained glass window includes the GAR medallion. 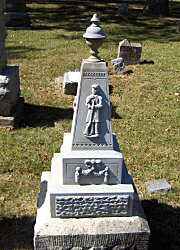 Description: This grave marker is dedicated to "Franklin Savoy, died Oct. 30, 1891, Aged 54 years, At Rest". 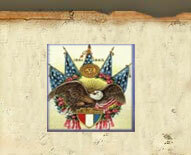 The reverse (shown) has a very detailed civil war soldier. The entire upper section, above the granite base, is identified as being from the Western White Bronze Co, Des Moines, Iowa. Description: A soldier at parade rest is mounted on a stone pedestal. An inlaid marble plaque features crossed rifles, a flag, crossed sabers, a fouled anchor and a field artillery piece. The accompanying inscription reads: "On fames eternal camping ground ~ Their silent tents are spread. ~ While glory guards with solemn sounds ~ The bivouac of the dead." 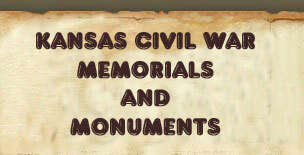 Description: "Marysville probably erected the first soldier monument in Kansas. 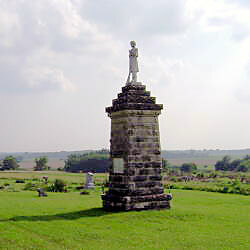 It is the usual statue of a soldier, with his gun at "order arms," made of Vermont marble, mounted on a base of native stone about six feet high. It cost $1350, not including the labor of constructing the base. The money was raised by G. A. R. post No.9, by giving public entertainments. There is a tablet on each side for inscription, one only being used. The inscription is as follows: "An acknowledgment of the debt which mankind owes to the heroes who fought to maintain the integrity of our national Union, and preserve to the world a government founded upon liberty and equality." It is the purpose to use the other tablets in time, and a friend suggests for one: "God has been good to Liberty's nation". Martin, 1910. The present inscription reads: "An Acknowledgment ~ Of The Debt ~ Which Mankind Owes ~ To The Heroes Who ~ Fought To Maintain ~ Our National Union, ~ And Preserve To The ~ World A Government ~ Founded Upon Liberty ~ And Equality." The other panels remain blank. 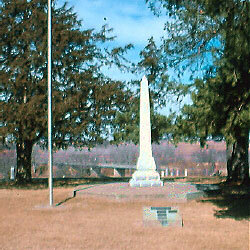 Description: A square granite spire is inscribed: "In Memory ~ Of Our ~ Fallen Comrades ~ 1861 - 1865".